Federal guidelines and Florida law differ when it comes to testing for a cancer-causing gas in schools, but we found some districts seem to miss the bar entirely. ST. PETERSBURG, Fla. -- It's colorless, odorless, tasteless. According to the Centers for Disease Control and Prevention, radon is responsible for more than 20,000 lung cancer deaths each year. The radioactive gas occurs naturally in the soil and enters homes and schools through cracks and openings in walls or foundations, often accumulating at unsafe levels. It's why our team of experts, from a medical doctor to the past president of the American Association of Radon Scientists and Technologists, says every building -- including your child's school -- should be tested regularly. Video: What is radon and why should I test for it? "The more radon you're exposed to and the longer you're exposed, the greater the risk of lung cancer,” says Professor Bill Angell, a nationally acclaimed expert on radon testing and past president of the association. “All parents should test their homes, as well as expect their schools, to test for radon and to test properly." The Environmental Protection Agency recommends schools get tested every five years. 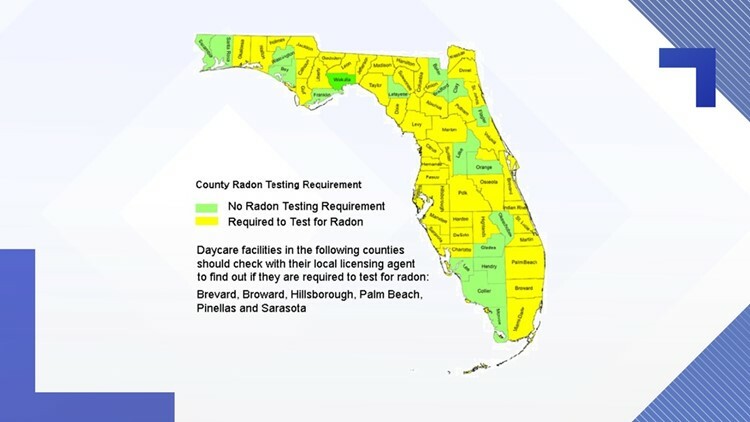 But in Florida, mandatory testing is only required for brand-new schools with a single follow-up test five years later; and that's only for schools located in a county categorized to have intermediate or elevated radon potential. Every Florida county highlighted in yellow -- all of Tampa Bay and the majority across the state -- has a school district that must conduct a radon test. ''Radon gas is ubiquitous. I use the term geographic bad luck," says Dr. Matthew Schabath, a cancer epidemiologist at Moffitt Cancer Center. Schabath was shocked to hear a 10Investigates' report found 230 schools in the Bay Area had not been tested since 1995. That's more than 20 years ago. "The state, it's a onetime deal and then you go on your happy way. To me, that's not sufficient, even in the state of Florida where most of our state is Zone 1 with pockets of Zone 2," Schabath said. "But the data shows even though the state of Florida is not considered a place of being high levels of radon, we're finding them there." Schabath says, at the very minimum, Florida should be following EPA guidelines. "That's where experts sit," he said. The state statute only requires schools to test 20 percent of the habitable first floor spaces while federal guidelines recommend schools test "all frequently occupied ground-level rooms." Those ground-level classrooms are the ones most likely to have elevated levels of radon. "That's just a huge gamble. To borrow a phrase, that's Russian roulette," Schabath said. "That just is terribly random, we know this room could have no levels of radon exposure, but the neighboring rooms could have an elevated level." So what is a high level of radon? The EPA's set action level is 4 picocuries per liter of air -- this is the point at which mitigation is recommended. ►How big is a picocurie? Our investigation found schools all throughout the Bay Area, where rooms tested at 19-20-27 picocuries -- and one room where a reading submitted above a 62. "We're talking 9-8 times the level of that 4 picocuries," Schabath said. "That's very disturbing that we are seeing those levels. The data suggests that your risk is so exponentially higher to lung cancer." Schabath calls those levels dangerous. "Without having that follow up data, we are handcuffed as parents to know what is happening to the exposure," he said. And maybe the most revealing: when it comes to classrooms showing high levels of radon, the state does not require mitigation, meaning schools are required to do nothing. Not a thing. They only have to report the numbers to the state. And while experts agree that states should follow EPA guidelines, 10Investigates found some school districts not following the state law. According to data from the Florida Department of Health, which maintains the school radon testing database: Manatee School District hasn’t tested a new school built after 2004. Polk County built 13 new schools since 2003, and only one of them has been tested. But that radon test took place nine years after it was open. Neither Hardee, Highlands, or Hillsborough counties submitted test numbers for any of their schools built in the past 15 years. With those five counties, that’s 66 schools with no idea how high the radon levels are. The Hillsborough County School District followed up with 10Investigates and said they have tested new schools in the past 15 years but failed to submit those numbers to the state. They are working on doing that now. They also say when it comes to a follow-up test, they've failed at doing so until now. They will be retesting all schools who haven't been tested since 1995 starting Thursday. When asked about the cost, they say that won't be an issue, they'll find the money. “I think this is a legitimate concern," Schabath said. "We know this is a bad element. This can cause cancer. Absolutely parents, school children, should be vocal about this." Schabath says, conservatively, we should be following EPA guidelines -- if not being more proactive. "Why take the risk? We’re talking about school kids, the formative years, being exposed to something potentially hazardous," he explained. "You would not want your child sitting in a room with cigarette smoke for 6-7 hours a day. Why have your child exposed to an equally dangerous substance?" Got a consumer story? Turn to Titus. Click here to put Jennifer Titus to work for you.